How your feedback has shaped the Library. The Reading Room will be the latest phase of the Library Refurbishment Project to complete. This newly refurbished space has been furnished to promote an ethos of silent study, with magnificent views over the surrounding landscape. It will open its doors to users at 8am on Friday 13th November. The final phase, A Floor West, is due to complete during December 2015. 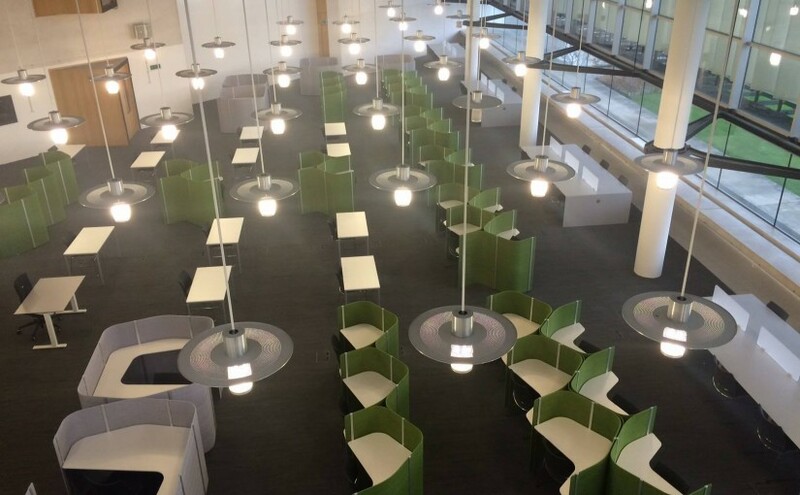 After an extensive consultation period with our students and staff, the whole Library has been designed to be a serious, academic study environment. Most of the workspaces are for individual study, in a variety of formal and informal spaces. Group work has been catered for by acoustically separate Group Work Spaces. So far, we have opened 27 of these, with 5 more to follow. So far our users have been overwhelmingly positive about the refurbished building and we are happy to be experiencing record attendance levels. We know that some of you have been experiencing disturbance from other users and are requesting more “zoning” of the building. We are actively reviewing how the space is working, and once the whole building is available to our users early in the New Year, we will decide how best to make the space work for everybody. Please continue to send us your observations and suggestions, so that we can build a complete picture of how well the building is working for you.